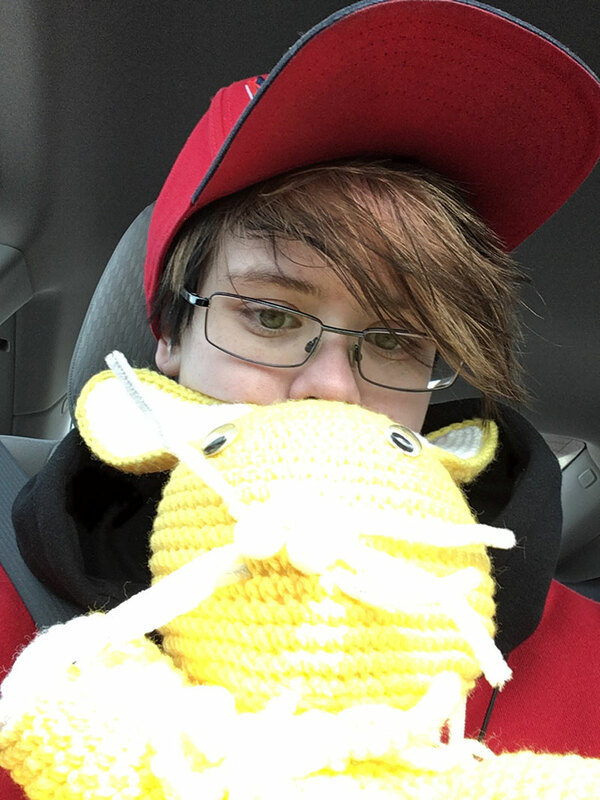 Sarah and Chris picked up this new friend, Whiskers, at an antique store. 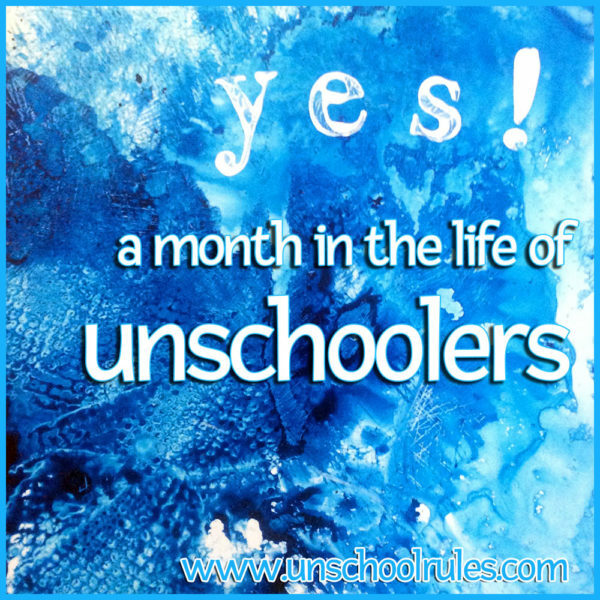 April was a bunch of unschooling fun, and one REALLY BIG thing happened – we are officially “done” Sarah’s compulsory education under Pennsylvania law! We’ll be continuing to wrap up the things we do together as a family (and the learning that goes with them) in posts like this one, but I wanted to take a minute and celebrate that milestone! So we’re done. Final paperwork submitted, nothing else required… right? WRONG! Of course there’s a graduation party. We’re hosting a cookout and backyard graduation ceremony May 27 for Sarah, and I have a HUGE favor to ask of all of you. Sarah had really wanted to host a HUGE party, and for various reasons it’s not going to be nearly as large of a shindig as she’s dreamed of. That’s where you come in. 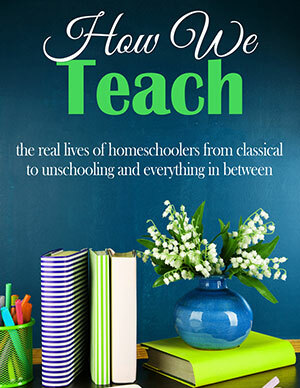 If you like reading about Sarah’s journey here on Unschool Rules, would you consider sending her a card or postcard with your best graduation wishes? She’d LOVE that (she loves getting mail) and it’d be a great way to extend our celebrating. And thank you all in advance for any love you’re willing to send Sarah’s way. It means a TON! That’s a whole lot of dumb right there. 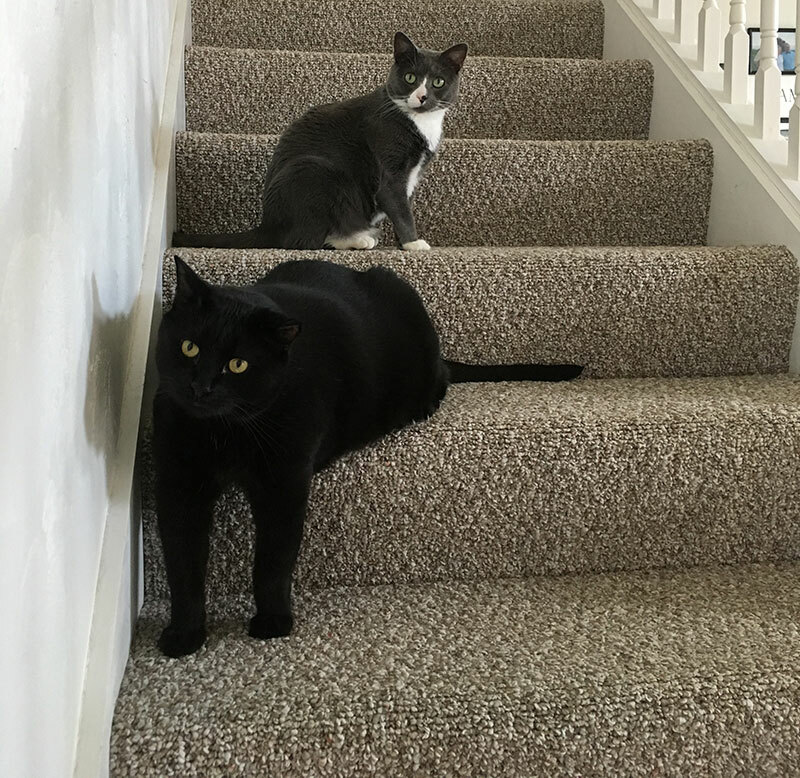 Mr. Angelino, top, and Mr. Bill, bottom. Names totally coincidental. 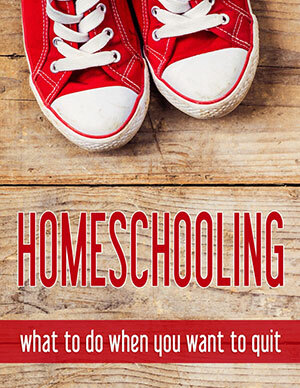 I talked last month about how we’d recently discovered Outschool. It’s a platform for independent online K-12 classes taught by all sorts of people – from certified teachers to hobbyists to trade professionals – and it’s amazing. 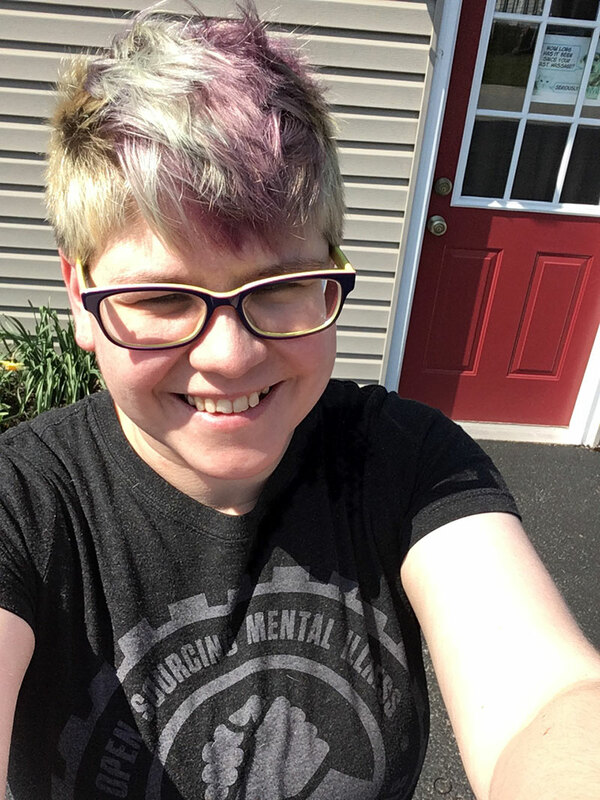 We’ve been doing mostly single-session classes, which range in price from about $10 to $20 an hour, but in April, Sarah completed a six-session Shakespeare roundtable for teenagers, which was $75 for the full course. I cannot speak highly enough about Outschool, which has been super-fun for us. 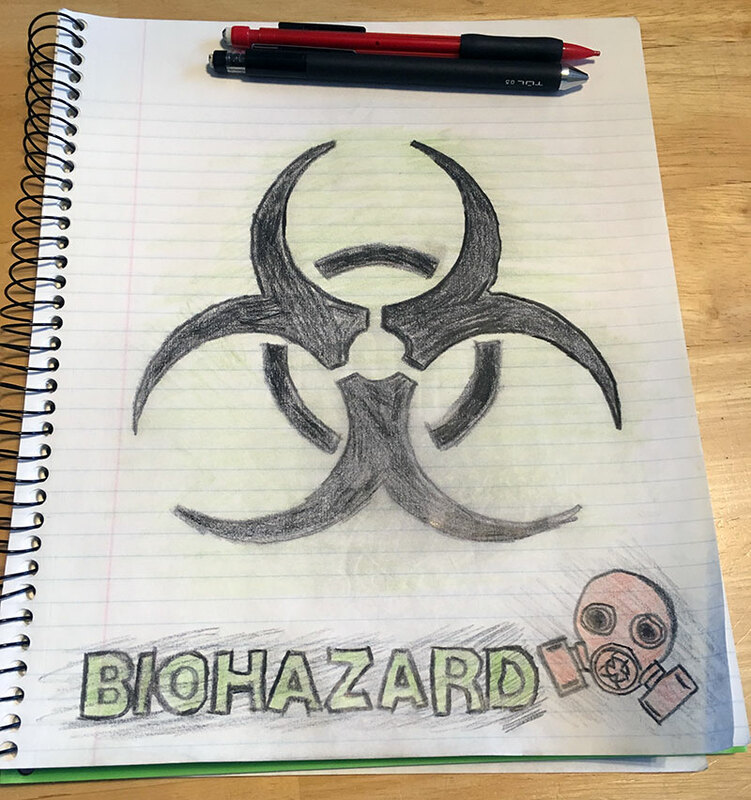 Sarah’s biohazard design, compiled from a few different reference images. You can’t see it well in this image, but she has some great faint green shading behind the main biohazard symbol. One thing Sarah has contemplated as a future career is tattoo artistry. 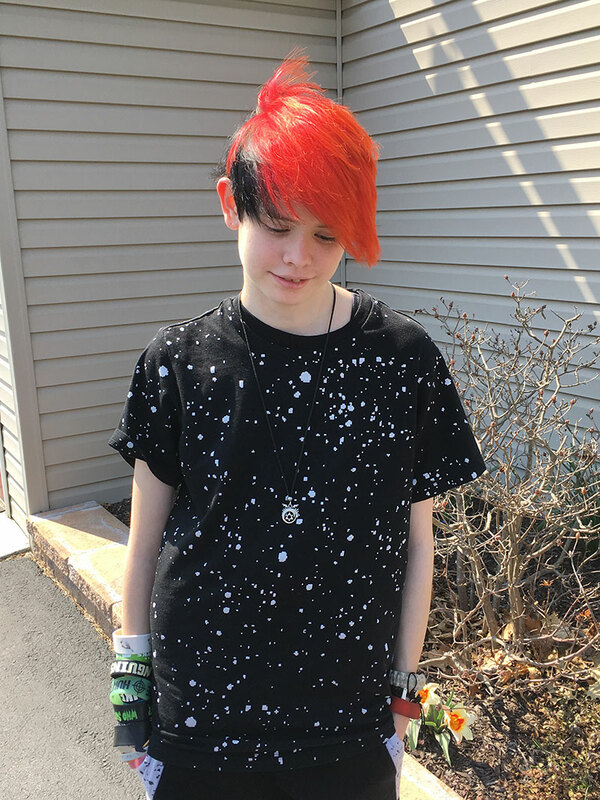 She did a bunch of reading and internet searching and found out that the best place to start with that at her age (since you can’t begin tattooing in Pennsylvania ’til you’re 21) is to build up a good drawing portfolio. Since then, she’s spent time almost every day working on art! Right now, she’s mostly tracing outlines from source images and then shading and coloring them to her liking, but she’s hoping to move up to some freehand drawing soon. She’s got quite the portfolio – everything from standard tattoo-style designs to images of Norman Reedus’ face. Sarah is also interested in photography – both modeling for photos and taking and editing them. So one night in April, she sat down for more than an hour with my best friend, Nina Myers, who runs her own photography business called CM&M Photography. Nina told Sarah all about different kinds of lenses and flashes, how she’s built her skills and more. It was a huge hit for both of them! 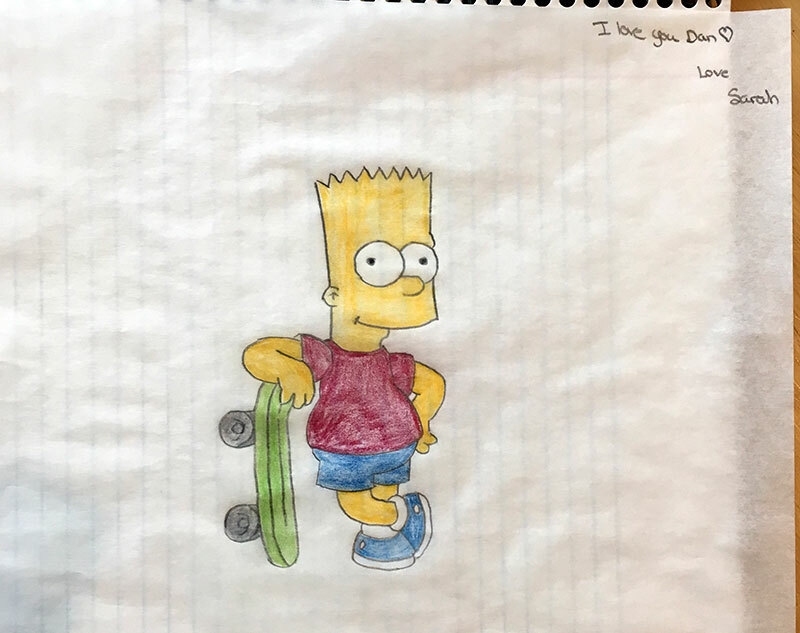 Sarah made this Bart Simpson (traced from a reference image) for Dan, who is a big fan of The Simpsons. Sarah also dug heavily into a book called True Crime, which is a collection of real newspaper articles about crimes from the 1800s to present. The Walking Dead – We got to do something REALLY cool. We took Sarah to see the season finale on the big screen as part of “Survival Sunday” on April 15. 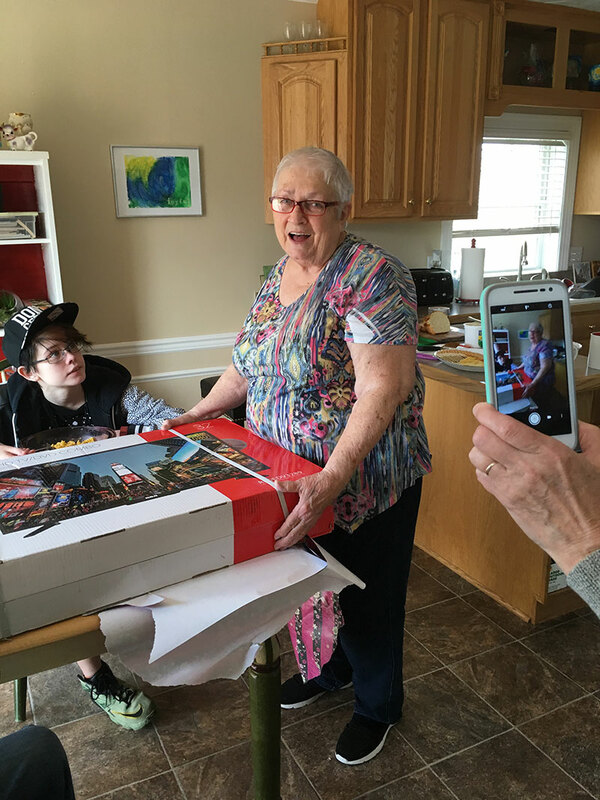 It was a surprise, and she was stoked! Lemony Snickey’s A Series of Unfortunate Events – This was not such a winner despite Neal Patrick Harris. The Crown – After Lemony Snicket, Mom and Sarah started this and are LOVING it! Jesus Christ Superstar – I thought this was SUPER cool. In Search Of – This is a neat documentary series with Leonard Nimoy that goes into weird areas. This month, Chris and Sarah watched episodes about the Nazca Lines and the Bermuda Triangle. James Cameron’s Story of Science Fiction – This was pretty cool and gave Sarah ideas of other movies she wants to watch. The World’s Most Extraordinary Homes – A very cool Netflix win. Sister Act and Sister Act 2: Back in the Habit – I happened to be in the mood to see these and Sarah had not seen them that she remembered, so the two of us and my mom spent a couple days enjoying them! Avengers: Infinity War – Chris got us all tickets to go see this, and that was very nice of him. And that’s all I have to say about that. The Chameleon – This is a cool borad/table game that we got for Christmas and just played for the first time. Dungeons and Dragons – You can read more about this one on Chris’s blog, Papergreat – it was very cool! I mentioned in September’s post on our unschooling planner system that our “rabbit trails” are the most fun we have in unschooling. By far the best one this month started when Chris and Sarah were working on their family trivia game – they make up trivia questions for the rest of us on a huge variety of unusual topics. Somehow this morphed into a huge discussion on global prioritization, economics and systems of government. I can’t begin to describe it but it was very cool. Sarah’s been writing a bunch of letters – to her Pappy John in Florida (Chris’s dad), to a fellow Walking Dead fan in Japan, and more. She loves letter-writing and getting things back in the mail. Sarah and Chris had a bunch of fun excursions to antique stores and to the local arcade, where Sarah got a high school on Ghostbuster pinball. We went to the local Jewish Food Festival, which had better main dishes and less-great desserts than the Greek Food Festival from a few months back. With the advent of nicer weather, we’ve been walking and bike riding a lot more in our neighborhood, and getting a chance to reconnect with our neighbors, which is nice. Sarah and I also spent one evening on a huge Pokemon Go hunt at a local park that is filled with them. Sarah filled in for a friend in a local bowling league. Sarah gave Dan some ideas for some really cool graphic designs – projects involving penguins that look like characters from The Walking Dead for instance. 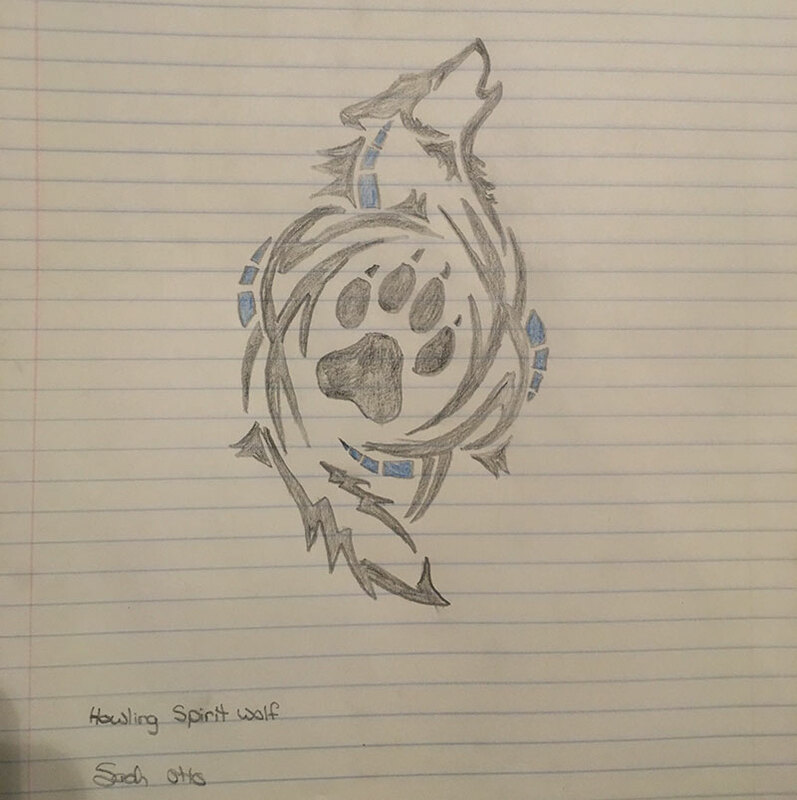 Sarah made this “spirit wolf” image based on tracing a reference image. Since our “curriculum plan” for this year featured not just Sarah but the other house adults, I figure I should give monthly updates on our progress too. So here’s a look at what’s new with the rest of us. I managed to read 16 books in April, including two by the aforementioned awesome Nadia Bolz-Weber. Other highlights were By far the best was Caroline: Little House Revisited by Sarah Miller, which is a retelling of the Little House books from the perspective of Caroline Ingalls, Laura Ingalls Wilder’s mother. Girls Like Us by Gail Giles was another amazing (and tear-inducing) read. I also got to do a bunch of scrapbooking and, in big news, Dan and I found out that we got a pretty huge freelance contract we’d bid on earlier this year with our web development business, Technical Penguins. Dan and I are officially planning our wedding. 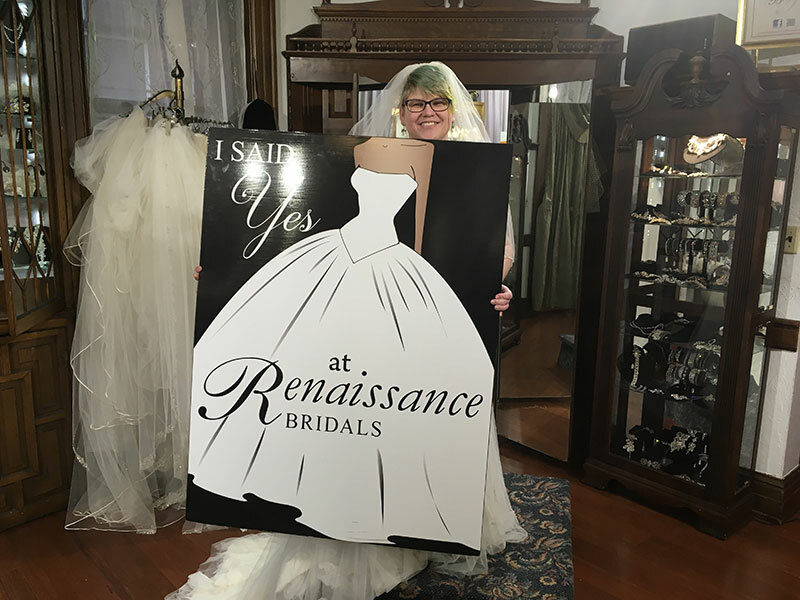 March 23, 2019 is the big day, and I already have my dress! Dan also reports he’s really liking reading At Home by Bill Bryson, which Chris is also reading. Dan says it’s a great look at both the depth and breadth of history. Chris wants to know where the [expletive deleted] April went. I’m pretty much in the same boat. Considering it SNOWED a couple of times in April, I want to know where all of spring went. He’s only a little bit kidding on the taxes thing. Mom and Sarah made some cookies together one day, which was cool. All five of us saw The Diary of Anne Frank at a local theater, and it was heartbreaking and very well done. Sarah, Mom and I went to see Nadia Bolz-Weber, an amazing (and F-bomb-dropping) Lutheran pastor, in Lancaster. I might go to church regularly if she were the pastor. She’s phenomenal. 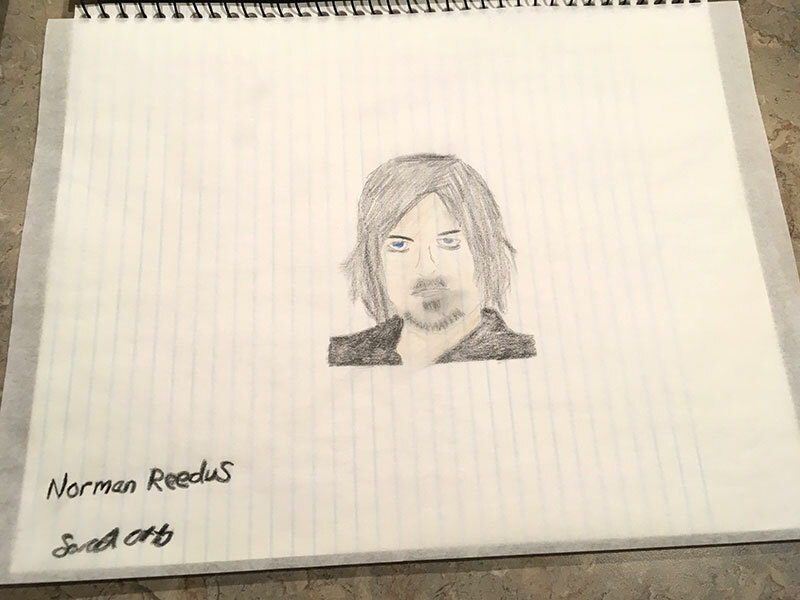 Sarah traced the outline of this image of Norman Reedus and did her own shading and colorizing! 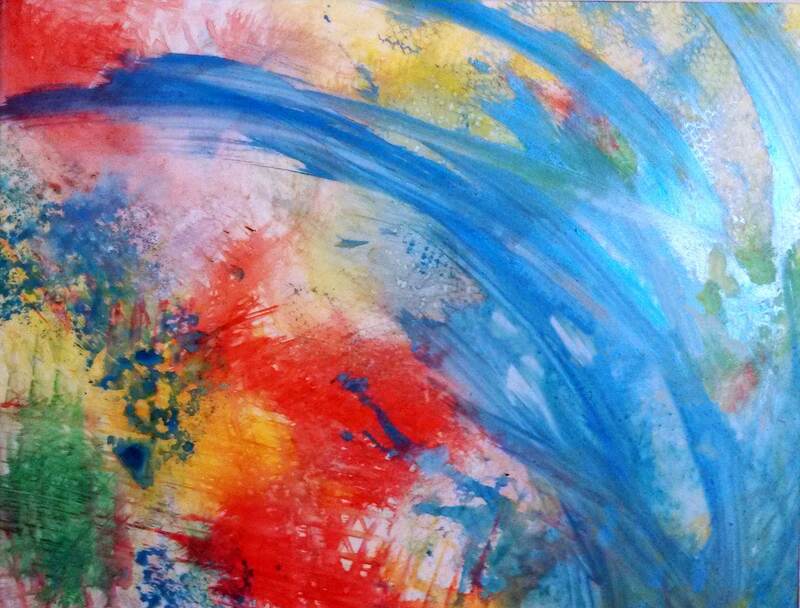 This entry is about arts and crafts, everyday life, family, graphic design, monthly wrapup, unschooling. 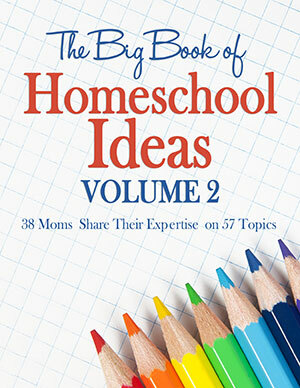 The previous post was Dare to be different: Homeschool learning from literary rebels throughout history. 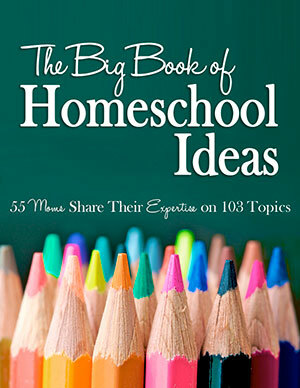 The next post is The ultimate guide to creating an unschooling high school transcript.